In true Liberal fashion, as the election gets closer and Turnbull sags in the opinion polls, they have reached for the refugee card. 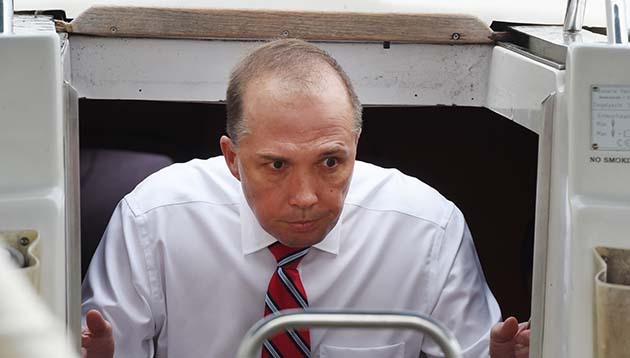 In a disgraceful, scare-mongering display, Immigration Minister Peter Dutton went on Sky News to declare that when it comes to refugees, “For many people, they won’t be numerate or literate in their own language, let alone English. These people would be taking Australian jobs, there’s no question about that. It was reminiscent of Kevin Andrews’ attempt to play the race card prior to the 2007 federal election, when he tried to scapegoat African refugees saying, “some groups don’t seem to be settling and adjusting into the Australian way of life”. Before the 2013 election another Liberal, Fiona Scott, notoriously claimed refugees were to blame for hospital queues and overcrowded traffic on the M4. Dutton’s comments alienated established migrant and refugee communities and brought widespread condemnation from ethnic community leaders. Even Channel 9 Today show host, Karl Stefanovic, lambasted Dutton. Two days later, Dutton was not willing to repeat his claims about refugees taking Australian jobs. It was a good sign that he had gone too far and that anti-refugee slurs were not going to work for the Liberals. Dutton was responding to The Greens’ policy of increasing the annual refugee intake from overseas to 50,000, agreeing with a 2GB shock jock that it was “crazy”. But 50,000 is only slightly more per head of population than the number Australia willingly accepted in the early 1990s. And rather than taking jobs, refugees create net demand in the economy. Malcolm Turnbull talks about “jobs and growth” but he is only interested in jobs for his big business mates and growth in profits. Turnbull and Morrison’s answer to increasing youth unemployment is $4 an hour “internships” for working up to 25 hours a week, potentially creating a cheap labour pool with no penalty rates, sick leave, or superannuation. Meanwhile the Liberals have cut funding for TAFE and apprenticeships. Refugees are not taking jobs. Australian bosses are doing the job cutting. In the last six months of 2015, three banks, Westpac, CBA and ANZ together cut 2547 full-time jobs. More than 50,000 mining jobs have been lost as the big mining companies protect their profits amid reduced commodity prices. Labor leader Bill Shorten rightly condemned Dutton’s comments, accusing Dutton of “insulting the migrant community” and reviving the “Pauline Hanson rhetoric of the past”. But all he demanded was that Turnbull pull Dutton into line. Shorten has been desperate to keep a low profile on refugee issues. He has promised to maintain offshore processing and continue the turning back of asylum seeker boats if Labor is elected. But an increasing number of Labor candidates—up to 21 according to The Australian—have been openly critical, or have been actively involved in things like the “Let Them Stay” campaign. Sophie Ismail, Labor’s candidate against Greens MP Adam Bandt says, “I have concerns about turnbacks, I don’t think they should be on the table.” Murray Watt, the lead Labor Queensland Senate candidate, moved the resolution opposing offshore processing at the Labor conference last year. He says that he supports current Labor policy “for the election”. Even Shorten’s rhetoric about offshore processing has changed. He now says that a Labor government would urgently seek third countries to resettle the people on Nauru and Manus Island. They won’t find third countries. But the changed rhetoric has raised expectations that Labor will get the refugees off Nauru and Manus. The failure of Dutton’s refugee-baiting and the cracks in Labor’s policy are a direct result of the campaign that the refugee movement has waged against the Liberals and against Labor policy. Regardless of the election result, the campaign will have to fight hard to end offshore processing. But the success of the Let Them Stay campaign, keeping the 267 people from Manus and Nauru in Australia, has shown that we can just as successfully fight to close Manus and Nauru for good. Rallies to close Manus and Nauru are planned for the start of Refugee Week, Saturday 18 June in Brisbane and Melbourne; and 19 June in Sydney.